Amazon’s latest Kindle Oasis ($270 as configured via Amazon) is the ultimate e-reader. Two important features debut with this 2017 model: It’s waterproof, and it supports audiobooks via Audible. Make no mistake: Reading on this device is a luxurious pleasure. With a starting price of $270 (or $250 with “Special Offer” lockscreen ads), however, the Oasis floats beyond many budgets. For everyone else, we suggest picking up a Kindle Paperwhite, which can be had for half the cost. For more options, check out our comprehensive Kindle buying guide, or explore the broader competition in our e-reader buying guide. The Kindle Oasis is priced according to memory amount, connectivity, and the presence or absence of Special Offers—yes, you must pay for the privilege of omitting ads from the bottom of your lock screen. Remember, too, that Amazon will store its own content for you in the cloud, so you don’t need to keep all your ebooks on your Kindle. For $270, the base unit (which we reviewed) offers 8GB of memory and Wi-Fi connectivity. With Special Offers, the price drops to $250. For $300, you can step up to 32GB of memory and Wi-Fi. With Special Offers, the price drops to $280. For those who roam frequently beyond Wi-Fi signals, a 32GB model with free cellular connectivity (AT&T 3G or 4G LTE, depending on location) is available for $350. Covers: Amazon offers two covers for the 2017 Kindle Oasis: A leather cover, and a waterproof fabric cover. Both covers also function as kickstands for the Oasis, with a flap that folds out to hold up the device. Battery: Amazon says the 2017 Oasis can run for up to six weeks on a single charge, assuming a half-hour of reading each day. Reading on our test unit for an hour or two a day over the course of a week, with Wi-Fi on, the battery still hasn’t dipped below three-quarters of a charge. The Kindle can charge fully in less than three hours, Amazon says, with the included USB charging cable. Since the release of the original Kindle Oasis, last year, Amazon has flipped its vision of what a luxury e-reading device should be. The original Kindle Oasis was built to be as svelte as possible without sacrificing readability, incorporating lightweight plastic, glare-free glass, and a smaller internal battery. The battery’s bump was a perfect handle, and it also served as a docking point for a magnetic cover-external battery combo. The Kindle Oasis (2017) is larger and sturdier than its predecessor, but it uses much of the same design language as the original model. Not so the 2017 Oasis. While it maintains much of the same design language as the original, the refreshed e-reader is larger, tougher, and feels and looks a lot more like a premium product than its predecessor. At 6.8 ounces, it weighs 2.5 ounces more than the original, thanks to its larger dimensions, a larger internal battery, and a slick aluminum backplate. The Oasis retains the handy battery bump, but for 2017 there’s no battery cover to be had. Covers for the 2017 Oasis are just, well, covers—one in leather, and one in waterproof fabric. The bezels are flush with the display, and all reside under a slab of glare-free glass. Three sides of the bezel are roughly a quarter-inch wide. The fourth side juts out an inch and contains two page-turn buttons, which are placed perfectly for keying with your thumb. Thanks to an accelerometer, the buttons can be used left or right-handed—just flip the e-reader around, and the screen will reorient itself to suit your needs. You can also turn the pages of what you’re reading by tapping the e-reader’s display. Unfortunately, there’s no way to turn off this option, and that became a hassle when the Kindle Oasis was used in watery environments (more on that in the Waterproofing section below). During long reading sessions, I found the 2017 Oasis just as comfortable to use as the 2016 version, despite its larger dimensions. I was surprised to find that the aluminum back panel of the new one was as easy to grip as the plastic panel on the original Oasis. Build quality is rock-solid and, in case you care, the leather covers feel and look great. The 2017 Kindle Oasis will continue to work even if submerged in up to two meters of water for up to an hour at a time. Amazon’s making a big deal out of the fact that the Kindle Oasis is its first waterproof e-reader. With its IPX8 rating, the 2017 Oasis can be submerged in two meters of fresh water for up to an hour at a time. Amazon offers more waterproofing information on its site. In truth, the 2017 Oasis finally gives Amazon a product comparable to what Waterfi’s aftermarket waterproofing treatment for the Kindle Paperwhite provides, and the sort of wet-environment performance Kobo’s Aura H20 Edition 2 and Aura One already offer. Testing the e-reader in the pool, shower and hot tub over a number of days, I feel confident that it’ll survive most liquids you throw at it. 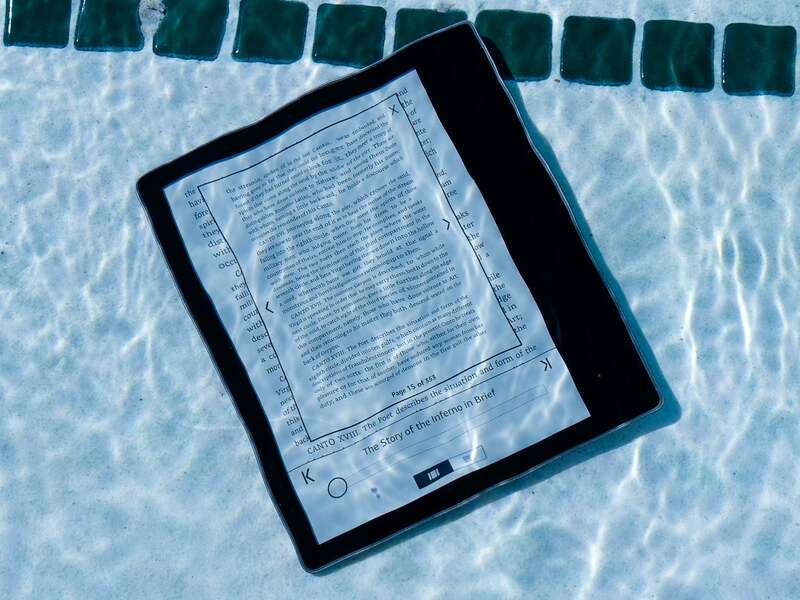 Amazon hasn’t solved the full-submersion issues that other waterproof e-readers also face. Granted, it’s unlikely you’ll hold it fully underwater when you’re actually trying to read, but it’s important to understand the limitations of this feature. Get a few drops of water on the Oasis display and it’s business as usual. Submerge it fully, and the device will register the large amounts of liquid as touches, causing pages to turn and options to change willy-nilly. 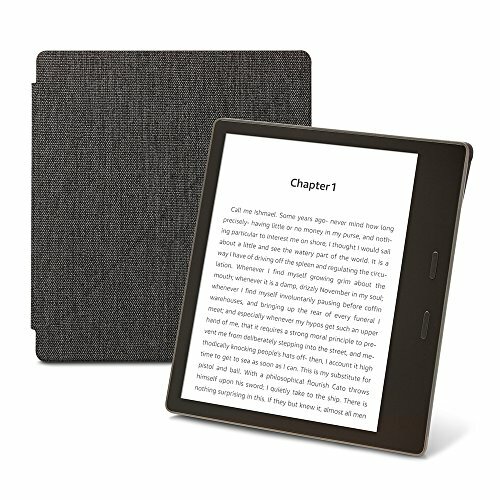 The 2017 Kindle Oasis has the largest display of any e-ink device currently offered by Amazon. The 2017 Kindle Oasis display is the largest in Amazon’s current lineup, measuring seven inches diagonal compared to six inches for the original version. This means fewer page turns or more room for larger font sizes to spread out. Like the original Oasis and Amazon’s current Paperwhite and Voyage models, the 2017 Oasis has a display resolution of 300 ppi. Text, at any size and in any font I chose (the options abound), was just as crisp and legible as if it had been laser-printed on a sheet of paper. The 12-LED front lighting is a huge help. 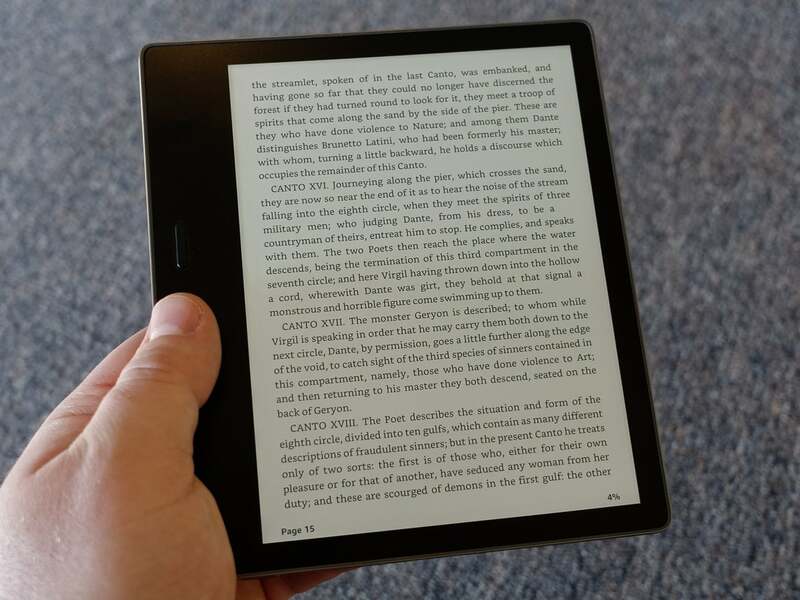 I found that, compared to Amazon’s second most-expensive reader, the 6-LED front-lit Kindle Voyage, or the lighting afforded by Kobo’s flagship device, the Aura One, the 2017 Oasis’ display lighting was far more consistent. 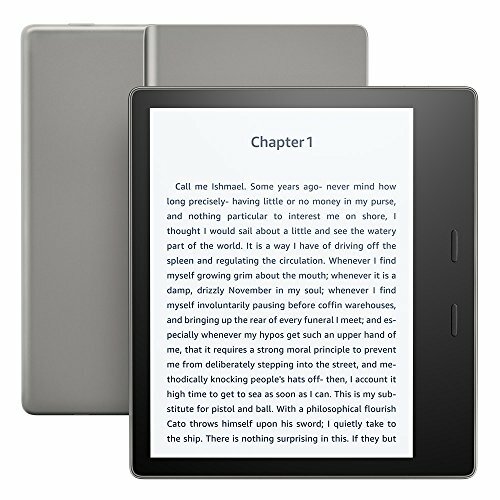 Display lighting can be controlled via the device’s on-screen UI, but, like the Kindle Voyage, the 2017 Oasis also comes equipped with a light sensor. This allows the device change the illumination level of its display based the amount of ambient light. I found that relying on the light sensor often resulted in a darker setting than I preferred, however. Owners of the 2017 Amazon Kindle Oasis can use the device to listen to Audible audio books via Bluetooth headphones. First, the good news: The 2017 Oasis is the first Kindle in years that has the ability to play audio. Users can download audio content from Audible and listen to them with a pair of connected Bluetooth headphones. If you happen to own both the ebook and the audio version of a given title, Amazon’s Whispersync service makes it possible to read until your eyes fall out and then pick up where you left off by listening to the audio version. It’s a great feature! 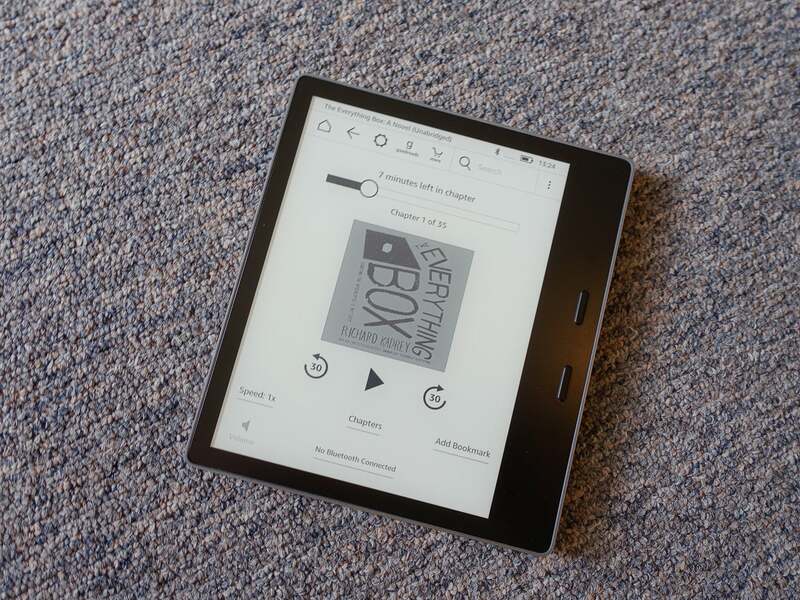 As noted in the full specs and features, the memory capacity of the Kindle Oasis can accommodate a hearty serving of a few dozen Audible audiobooks, or a gluttonous mound of well over a hundred, depending on how many ebooks you already have on there as well. Now for the bad news: Amazon keeps you on a tight leash. It supports only Audible content, meaning you can’t side-load audiobooks, podcasts or music from third-party sources. I attempted to do so with a number of different audio formats. No dice. The Kindle Oasis (2017) represents a long-awaited upgrade to Amazon’s e-reader product line. Waterproofing and Audible content support lift it above the competition. At the same time, Amazon keeps the experience familiar and comfortable. 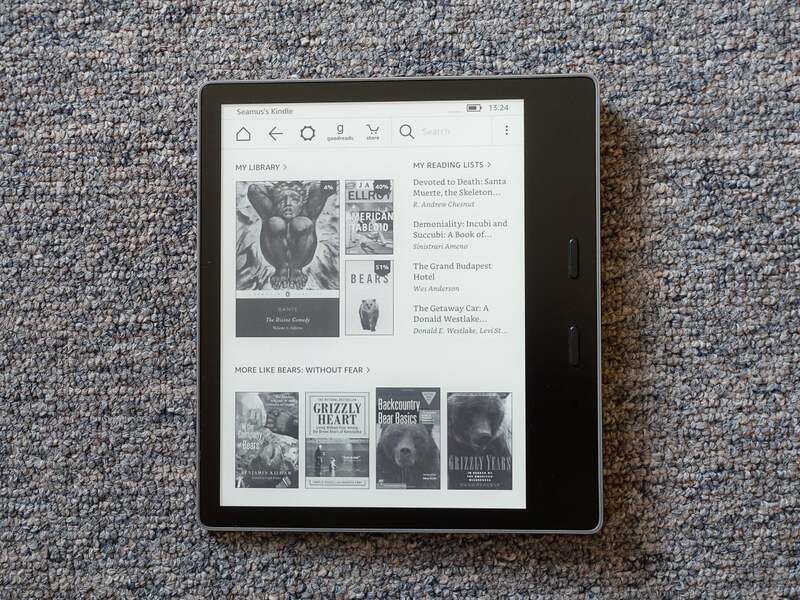 That’s partly because it’s been a long time since Amazon gave its e-reader operating system anything resembling an overhaul, for better or worse. But the better part of that scenario is that anyone who’s picked up a Kindle in the past five years will find the 2017 Oasis easy to use. Front lighting, Wi-Fi, and Bluetooth controls are easy to find. The ability to tweak your reading experience with 14 different font sizes and 10 different fonts (including a bold typeface and OpenDyslexic), or alter a text’s line spacing and margins, are all big pluses for readers. But the real advantage to owning a Kindle is the vast variety of content that you can read—and now listen to, on one device. To date, no other company can come close to matching the vast selection that Amazon Kindle owners enjoy: newspapers, comic books, magazines, books and audiobooks. Now the Kindle Oasis offers the best luxury cruiser for consuming that content. Waterproof, superbly built and a pleasure to use, the All-New Kindle Oasis is one of the best e-readers we’ve tested. While its high price may make it undesirable for casual readers, serious e-book aficionados will find it well worth the money.